Saturday Garbage Plate: Thanksgiving ed. Ghosts of Thanksgivings past. Shane holds onto a plate of our Thanksgiving feast circa 2007. 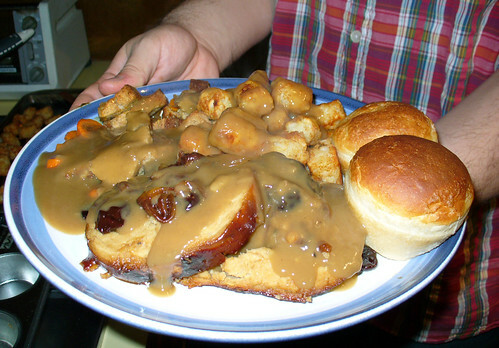 The NOMs include: a Roast Tofurky baked with Caramelized Onion and Cherry Relish; roasted potatoes and carrots; stuffing; tater tots; gravy; rolls; and, for dessert, apple pie topped with vanilla So Delicious ice cream. Yum! Only four weeks ’til X-Mas, folks! Cue: mass panic. I’m spending the weekend decorating in anticipation for next week’s holiday card photo shoot, so sorry, not a whole lot of time to chat. Let’s get to those links, mkay? Most of these involve Thanksgiving menu suggestions, which can easily be adapted for upcoming winter holiday festivities. Monday: Vegan Thanksgiving Menu Ideas: Cornucopia of Recipes from Happy. Healthy. Life. Posted: 11/27/10 at 6:33 pm. Filed under: Saturday Garbage Plate. Tango the blue, yellow and white macaw. Photo courtesy Burge Bird Rescue. Meet Tango, this week’s Friend in need! Tango is just one of many birds in the area who need an adoptive home to call their own. Tango plucks his chest a bit, but had perfect blood test results, so it may be from boredom or stress and may resolve once he gets settled into a new home. He is a sweetheart and likes to be petted once he gets out of the cage and gets used to you. He is only 8 years old, with lots of good years ahead of him. Our birds are not available for breeding. Potential adopters must call for an appointment, and must pass a screening interview to ensure that our birds are going to a safe home. Adoption fee $400 negotiable for the right home. If you’d like to adopt this gorgeous guy, contact Burge Bird Rescue today! FYI: Beak N’ Wings in Shawnee Mission, KS also has a number of bird companions available for adoption. Posted: 11/26/10 at 5:09 pm. Filed under: Find-a-Friend Friday. CC image via Flickr user Veganbaking.net. This week’s Garbage Plate is sweets piled on top sweets, with some cheap eats on the side and an after-dinner mint shot acting as an oh-so-refreshing chaser. Can I get a #nomnom? By the way, it’s not too late to celebrate a gentle Thanksgiving by going vegan and sponsoring a turkey rather than consuming one this holiday season! Enjoy this footage from our 2006 and 2007 Celebrations FOR the Turkeys at our New York Shelter. Our rescued turkeys become the guests of honor and indulge in a festive feast of pumpkin pie, squash, cranberries, and other goodies made just for them! Posted: 11/20/10 at 4:49 pm. Filed under: Saturday Garbage Plate. Kittens, by five: black and brown and orange, oh my! Photo courtesy Foxwood Animal Hospital. OMG Y’ALL FOXWOOD ANIMAL HOSPITAL HAS THE CUTEST MOTLEY CREW OF KITTENS AVAILABLE FOR ADOPTION! They’re only a few months old, and super-tiny, and their fur is all the colors of the rainbow! Okay not really, but some of the little guys and gals are different colors: there are three black kittens, one black and brown tortoise shell, and an orange and white mini-Morris-looking baby. Normally I don’t feature the pups and kits, since they’re usually the first to be adopted in shelter/rescue situations, but OMG THE CUTENESS! Very sweet and playful. Current on shots, Adoption fee is $75 and that includes shots and spay/neuter and felv/fiv neg. Seriously, if you adopt one of these buggers, you must invite me over to cat-sit some time. What’s that? Cats don’t need sitters? Poppycock! If kittens aren’t your cup of love, Foxwood has plenty of adult cats in need of homes, too. Adopt, don’t shop! Posted: 11/19/10 at 6:15 pm. Filed under: Find-a-Friend Friday. Spay & Neuter Kansas City recently announced the start of its second annual pledge drive. From now until February 24, 2011, participants can compete to win one of three prizes, with the top fundraiser receiving two round-trip tickets on Southwest Airlines and $300 worth of hotel accommodations. (The second and third prizes are a Magellan RoadMate 3065 and a $100 gift certificate to Petsmart, respectively.) The money raised will be used to spay and neuter Kansas City area dogs and cats in need – a core mission of SNKC. In addition to the pledge drive, SNKC is also hosting a winter donation drive. Along with gently used dog houses, the group is in need of the following items: dog and cat food (e.g., to stock SNKC’s “pet” food pantry); straw; leashes and collars; dog and cat toys; and, of course, monetary donations, which will help to pay for spay/neuter procedures, gas for transportation, new dog houses, and veterinary care for sick and injured dogs and cats. You can find more information on donating and view SNKC’s full wish list here. Posted: 11/16/10 at 10:24 am. Filed under: Kansas City Happenings.